GENEVA, April 9 – UN Watch condemned the UN for today electing the criminal regime of Iran to its commission on crime prevention, and to two other top committees. UN press release is here. UN Watch has also learned that Iran is a candidate for the Executive Board of UN Women, the highest world body for women’s rights. The vote, originally scheduled for today, has been postponed to tomorrow. UN Watch condemns Iran’s candidacy because of the regime’s despicable record on women’s rights, as documented in detail at our recent Geneva Summit for Human Rights, and in October at our panel of Iranian dissidents. 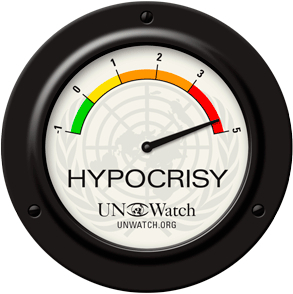 UN Watch urges the United Nations not to elect a misogynistic regime to oversee women’s rights. TEHRAN, Apr. 09 (MNA) – The Islamic Republic of Iran managed to win membership in the executive board of United Nations Children’s Fund (UNICEF), the Commission on Crime Prevention and Criminal Justice, and Committee for the United Nations Population Award for next 3 years beginning in 2016.